Recalling adventures in space: Lieutenant General Thomas Stafford and Air Force Major General Alexei Leonov meet at the OMEGA Pavilion. The legendary space explorers share stories from their experiences beyond our earth. 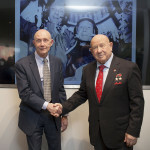 On 10 February, guests at the OMEGA Pavilion in Sochi witnessed the reunion of astronaut Lieutenant General Thomas Stafford and cosmonaut Air Force Major General Alexei Leonov at an event highlighting the significance of past space explorations. The astronaut and the cosmonaut are best known for their roles in the space race, their extensive work on a number of space missions for their countries and their meaningful handshake during the Apollo Soyuz Test Project (ASTP) in 1975 – a gesture that is often said to have played a role in ending the Cold War. The ASTP was the first joint flight between American and Soviet spacecraft and this historic event and its significance were discussed during a question-and-answer session on stage at the Pavilion. Stephen Urquhart, President of OMEGA, recounted his brand’s involvement in space exploration, saying: “I think people underestimate the value of the encounter of the Apollo Soyuz Project.” He pointed out that the project’s significance has been overshadowed by the lunar landings that had taken place a few years earlier adding that while the missions to the Moon were extraordinary technological achievements, Apollo Soyuz had long term political and sociological significance that continues to resonate. OMEGA is defined by its pioneering spirit and has actively participated in some of mankind’s most challenging and fascinating adventures, including the conquest of space and all six lunar landings. The brand is proud to include space legends Buzz Aldrin, Gene Cernan and Thomas Stafford in its family of prominent brand ambassadors. 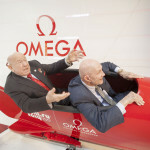 Discover OMEGA’s role at Sochi 2014 by following this link. 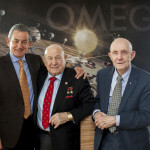 This entry was posted in Press Release and tagged Alexei Leonov, Thomas Stafford on February 10, 2014 by Dale Vito.